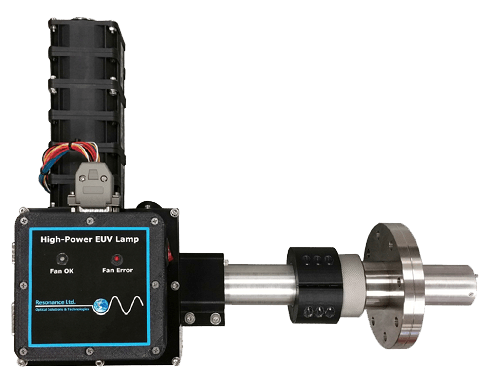 RF powered lamp systems are a reliable and maintenance-free high intensity source of deep VUV emissions between 116 and 200 nm. This source mounts to a 4.5-inch CF flange for easy connection to a high-vacuum system. VUV fluxes greater than 100 milliwatts/sterad are delivered through the MgF2 window for vacuum applications such as photoionization TOF mass spectroscopy. We design and manufacture VUV/UV spectrometers & spectrographs, monochromators, VUV/UV light sources and systems, remote sensors for gas detection and related products. With over 35 years of specializing in VUV to IR applications, Resonance Ltd. has built up a complete line of high-end products and systems to address almost any need. Our modular designs allow for fast and easy swapping between components, greatly increasing the versatility of our products while reducing down-time.